1 oz. l 30 ml. 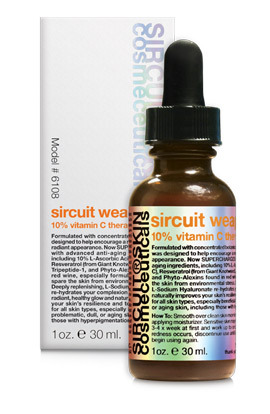 Sircuit Weapon™+ is formulated with concentrated botanicals designed to help encourage a more youthful, radiant appearance. SUPERCHARGED with advanced anti-aging ingredients, including 10% L-Ascorbic Acid (Vitamin C), Resveratrol (from Giant Knotweed), Copper Tripeptide-1 and Phyto-Alexins found in red wine especially formulated to help spare the skin from environmental stress. Deeply replenishing, L-Sodium Hyaluronate helps to re-hydrate your complexion resulting in a radiant, healthy glow and naturally improving your skin's resilience. 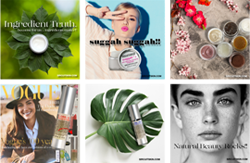 Put the power of science on your side, only to look younger and more beautiful as the result. Your complexion will thank you and we thank you! Helps to slow the signs of aging. Helps to neutralize free radical damage and to protect against oxidative stress. Helps restore hydration and improve radiance. Helps to reduce the appearance of fine lines, wrinkles. Skin Type: Suitable for all skin types, especially beneficial for problematic, dull, or aging skin including those with hyperpigmentation concerns. How To: Smooth Sircuit Weapon™+ over clean skin morning and/or night, before applying moisturizer. Dispense a dropper full on the back of your hand and apply to the face with light tapping motions avoiding eye area. Sensitive skin may want to begin by using 3-4 times a week at first and work up to once daily. If irritation or redness occurs, discontinue use until skin is clear and then begin using again. Shake well before use. Witch Hazel (Hamamelis Virginiana Extract): Provides astringent characteristics that can help soothe problematic skin. Ascorbic Acid (L) 10%: Stable and effective form of Vitamin C with benefits that enhance skin’s radiance and promote a natural, healthy glow. This antioxidant helps guard against oxidative stress and has been shown to have photo-protective properties that help improve skin quality and appearance. Sodium Lactate (L): The sodium salt of Lactic Acid that can help provide the skin with brightening properties. Sodium PCA (L): An intensely moisturizing and hydrating ingredient that has been shown to help decrease water loss from the skin’s surface as well as draw in moisture from the surrounding environment. By significantly increasing the water content in the stratum corneum, various skin factors such as barrier function and texture can be improved. Resveratrol (from Giant Knotweed): A potent antioxidant rich in polyphenols with skin protective and anti-aging properties for younger-looking skin. Glycine Soja Protein: A natural source that provides moisturizing and firming characteristics. Black Currant Oil: An efficient and emollient antioxidant. Wine Extract: An anti-aging antioxidant that works synergistically with Resveratrol to help to protect the skin by neutralizing free radicals present in the environment. Copper Tripeptide-1: An important anti-aging antioxidant that helps to protect against external stressors and neutralize free radicals. It can also induce a skin-tightening effect that potentially improves firmness and skin elasticity which enhances the skin’s overall quality and appearance. Sodium Hyaluronate (L): An intensely moisturizing and hydrating ingredient that is found to boost overall skin hydration by improving moisture retention at the skin’s surface. This moisturizing benefit also helps to improve skin roughness leaving skin to feel soft and smooth. Squalane: An emollient from olives that provides moisturizing properties that benefit the skin. It helps keeps skin soft while it also helps to prevent loss of water from the skin providing improved hydration and reducing dryness, thus enhancing the skin’s overall quality and appearance. Proline (L): An amino acid that has the ability to strengthen and renew aging skin. Tocopherol (D-Alpha): A Chirally Correct form of Vitamin E and the most effective. Extracted from natural bean and seed oils, this powerful anti-aging antioxidant helps to defend the skin from damaging free radicals present in the environment which can prematurely age the skin. Formulated With: Hamamelis Virginiana (Witch Hazel) Water, Aqua (Water), Ascorbic Acid (L), Alcohol Denat., Sodium Lactate (L), Glycerin, Sodium PCA (L), Polygonum Cuspidatum (Giant Knotweed) Extract, Santalum Austrocaledonicum (Sandalwood) Wood Oil, Citrus Medica Limonum (Lemon) Peel Oil, Glycine Soja (Soybean) Oil, Citrus Tangerina (Tangerine) Peel Oil, Citrus Aurantium Dulcis (Orange) Peel Oil*, Mentha Piperita (Peppermint) Oil, Citrus Aurantifola (Lime) Oil*, Vanilla Planifolia Fruit Oil, Citrus Grandis (Grapefruit) Peel Oil, Ribes Nigrum (Black Currant) Seed Oil, Rosa Damascena Flower Oil, Wine Extract, Cassia Angustifolia Seed Polysaccharide, Lonicera Caprifolium (Honeysuckle) Flower Extract, Lonicera Japonica (Honeysuckle) Flower Extract, Copper Tripeptide-1, Sodium Hyaluronate (L), Polyglyceryl-4 Caprate, Caprylyl Glycol, Squalane, Proline (L), Sorbitol, Tocopherol (D-alpha), Glutathione (L), Phenoxyethanol, Potassium Sorbate, Xanthan Gum, Melia Azadirachta (Neem) Leaf Extract, Melia Azadirachta (Neem) Flower Extract, Curcuma Longa (Turmeric) Root Extract, Lawsonia Inermis (Henna) Extract, Ocimum Basilicum (Basil) Leaf Extract, Mica. *USDA Certified Organic | NOP. Phthalate-free. Caution: For external use only. Please avoid contact with eyes and keep out of the reach of children. For best results: Keep out of sunlight and store away from any heat source in a cool, dark place. 4 oz. l 120 ml. 1.3 oz. l 40 ml. 2 oz. l 60 ml. promotions, and tips from our pros.